Robotic surgery offers cancer patients a minimally invasive alternative to open surgery and in some cases, may minimize or eliminate the need for chemotherapy and radiation therapy. A Carol G. Simon Cancer Center at Morristown Medical Center and Overlook Medical Center, we use the da Vinci® Surgical System to treat cancerous conditions when appropriate. Adrenal tumors are usually small enough to be removed using manual laparoscopic methods. However, like patients with kidney tumors, certain adrenal tumors have physical features, which may accommodate the use of robotic surgery tools, eliminating the need for large, open incisions. Bladder cancer sometimes necessitates removal of the bladder. Robotic surgery may be used to both remove the organ and reconstruct a system for urinary diversion. Robotic surgery is an ideal treatment option for most patients with endometrial cancer, endometrial pre-cancers, cervical cancer and early ovarian cancers. Morristown Medical Center is the only hospital in New Jersey to treat endometrial cancer with an add-on to the da Vinci® Surgical System called Firefly™ Fluorescence Imaging. With technology that is similar to night vision goggles, Firefly helps surgeons more clearly identify the cancerous areas of the endometrium during lymph node dissection procedures. Cancers of the mouth may sometimes require a glossectomy or partial tongue removal. Morristown Medical Center uses robotic surgery for these procedures, which allows surgeons to remove the cancerous portions of the tongue without having to make incisions in the jaw or reposition the lower jaw bone. Some small kidney tumors may be resected, but this procedure often requires delicate kidney reconstruction that can best be performed using the da Vinci® Surgical System. Larger kidney tumors of intermediate size or those in a particular location may require total kidney removal, which is usually done through manual laparoscopy, though robotic surgery may also be an option. Atlantic Health System treats kidney cancer using the state-of-the-art Firefly Fluorescence Imaging add-on. During partial nephrectomy procedures, a dye is injected into the patient’s blood stream, highlighting the sections of the kidney that are cancerous. Our surgeons then use Firefly to clearly locate the highlighted tumors and remove them while preserving the healthy surrounding tissue. One option for men diagnosed with prostate cancer is removal of the entire prostate, also known as radical prostatectomy. Using traditional surgical methods, this procedure can be challenging because the prostate gland is located in an area of the pelvis that is difficult to reach, and the urinary tract must afterwards be reconstructed. 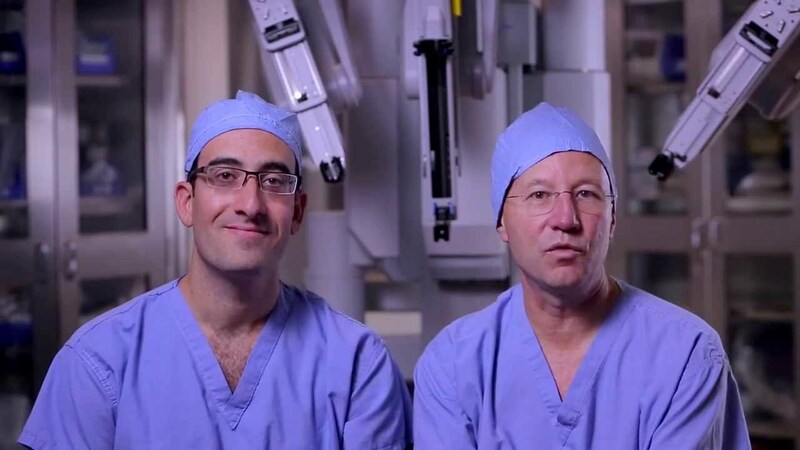 As a result, robotic surgery is now the most common method for removing a cancerous prostate gland. It allows for better urinary tract reconstruction and the preservation of delicate nerves, thereby limiting post-operative complications, like incontinence and erectile dysfunction.